Last Saturday morning we came home from a wonderful wedding in Long Island. We had so much fun the night before we wanted to keep the fun going. So we dropped off our bags at home and went right out to the West Village for brunch. I had heard a lot of good things about the new Yerba Buena and there was an open reservation on Open table so we headed there. We got there right around 2:00 and the place was barely even half full. That should have been my first clue that maybe this place wasn't going to be very good. I gave my name at the hostess station and she looked up the reservation with a kind of glazed over expression. Then she walked us over to a dimly lit table behind the waiter station in the back. This was by far the worst table in the restaurant. Now I'm not very picky about seating, but why put us here when there are plenty of open tables that are much much better? Well I didn't want to make a big deal about it so we just sat down anyway. But what happened next was downright ridiculous. The hostess never gave us any menus. I figured maybe someone else would come by to greet us but no. For at least 15 minutes we sat there. No menus, no contact from any of the waiters or busboys, nothing. And it wasn't like they didn't have plenty of staff. The hostess had been joined by two men up front who were all just chatting away, there were multiple waiters, bus boys and bartenders walking through the restaurant. It was just like we didn’t exist over at our tiny table. I really wanted to wait and see how long this could possibly last but I was starving. Finally I flagged down someone walking by. Menus finally in hand it was another 10 minutes before a waiter arrived. We were actually about to walk out right when he showed up. Not wanting to be completely rude we just placed an order and hoped for the best. Although after asking if we wanted either sparkling or still bottled water I should have known. Unfortunately things were only going to go downhill from there. It took another 15 minutes to receive our drinks and although every other table had chips and salsa, those extra little things never came to ours. When the entrees finally did arrive the long awaited food was less than good. 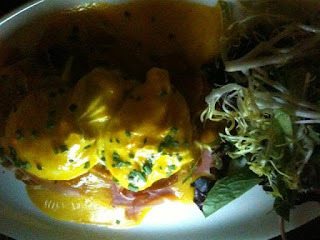 I ordered the Capacha Benedict. My first bite of this dish was actually alright. I enjoyed the asadero cheese and eggs. Then I hit the ham, hollandaise and corn cake bottom. Man! Someone was seriously heavy handed with the salt in that kitchen. After two or three bites I had drained my water glass and I had a bite of the salad and even that was salty! Mr. T had ordered the Green Chili burger with fries. While the burger wasn't horrible it didn't have a really good meat flavor. Maybe we have been eating too many upscale burgers lately but this just tasted like ground chuck with a little bit of spicy green BBQ sauce on top. I actually loved the french fries, but since Mr. T hates shoestrings he was out of luck as well. Our side order of bacon wasn't even good. One end was thick and chewy while the other ends were all fat and gristle. By the time the waiter finally came back to see how we were doing I responded by politely asking for the check. Mr. T and I left Yerba Buena and agreed it was the worst brunch we had ever been too. Both of us agreed that even our drinks didn't taste very good. I can forgive a restaurant for having an off night but the level of food and service was downright awful. I felt like someone had taken my fabulous morning mood and stomped all over it. Luckily Blind Tiger is just around the corner so we enjoyed an early afternoon pint and continued on with our day happy.